Influenza is a widespread viral illness that can be fatal. The spread of influenza can be contained by vaccination, but the virus causes many deaths worldwide each year. The emergence of a pandemic strain of influenza virus is an ongoing global health concern. 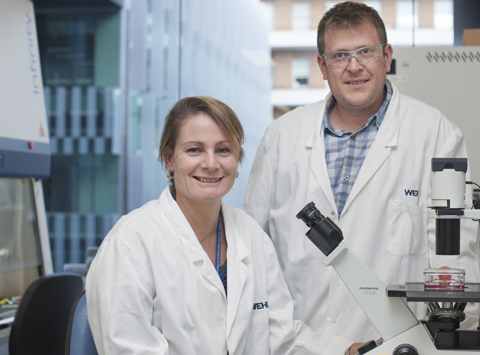 Our research is revealing the dual roles of the immune system in preventing influenza infection, and contributing to serious influenza symptoms. Understanding how immunity to influenza develops. Revealing how inflammation worsens illness from influenza infection. Discovering new strategies to improve immunity to influenza, and how illness is treated. Many of the symptoms of influenza are a consequence of the immune response to the influenza infection. Influenza occurs when the influenza virus is inhaled. It can be spread between people, or, in some strains, from animals such as birds or pigs, to humans. Different strains of influenza virus exist. These have different severity and infect different species. Most human influenza is caused by the ‘influenza A’ virus. Influenza strains can be distinguished by variations in two surface proteins called haemagglutinin (H) and neuraminidase (N). Influenza strains differ in the species they infect – some influenza viruses cannot infect humans. They also differ in the severity of their disease. Influenza occurs more frequently in cooler months. This is termed ‘seasonal influenza’. Each year, different strains of influenza virus occur. Exposure to these viruses leads to people becoming immune to them – they are protected against a second infection. Emergence of a new influenza virus strain that few people have already established immunity to. The virus triggering a larger-than-usual immune response, which causes illness and death, particularly in young, otherwise healthy people. Illness and death from influenza are a substantial global health burden. There are more than 500,000 influenza-related deaths annually. Previous influenza pandemics have claimed the lives of millions of people in one or two years. Who is at risk of serious influenza illness? Outbreaks of pandemic influenza often cause death in young, otherwise healthy adults. This may be because pandemic influenza triggers a harmful immune response. Influenza can be prevented by vaccination. Current vaccines can only trigger protective immune responses to individual strains of influenza virus, not all strains. For this reason, influenza vaccination does not offer lifelong immunity and annual vaccination is required. Influenza spread can be reduced by good hygiene, and by avoiding contact with infected people. The World Health Organization and government agencies oversee influenza surveillance programs to enable early responses to new strains of influenza to reduce the spread of the virus and prevent pandemics. Antiviral medications are available to treat influenza infections. These block the entry of the virus into cells and can reduce symptoms if given early in the illness.